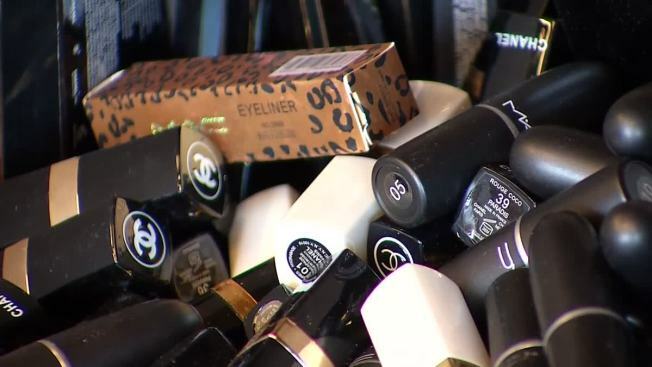 Six people were arrested and tens of thousands of dollars of fake makeup and beauty supplies were pulled from the streets after an eight-month investigation by the Grand Prairie Police Department. "The investigation started back in March and concluded on our end when the persons involved were arrested this month," said Grand Prairie Police Detective Caleb Haynes. In April, police executed search warrants at three homes – one in Euless, one in Hurst and one in Fort Worth – and large amounts of counterfeit goods were confiscated. In all, 2,847 counterfeit items worth $40,797 were seized as well as $15,714 in cash, two trailers and a truck, according to Grand Prairie police. Grand Prairie police say those arrested include Martin Pacheco Rico, 51; Maria Pacheco, 48; Alma Norma Pacheco, 26; Ruben Ortega Rodriguez, 30; Mayra Pacheco, 28; and Adrian Suarez, 36. They face charges for trademark counterfeiting. A tip that counterfeit cosmetics were being sold at Traders Village, a large flea market in Grand Prairie, led police to work with Traders Village to investigate. The business has long worked with the investigators to help prevent and stop the sale of counterfeit items. "I haven't personally seen anything this big, but we work very hard trying to keep an eye out for it," said Jerry Holt, marketing manager with Traders Village in Grand Prairie. "Every weekend that we're open we have people that will walk the market observing what is being sold, and if they see something they think might be suspicious we'll notify the authorities here or the companies that are involved." Neither police nor Traders Village could say how long the fake items had been sold, but aside from being illegal police say the counterfeits can be dangerous. "With products that are made overseas that are counterfeit, there is no FDA approval, no regulations, so you don't know what you're putting on your face. So, yes, it could be very dangerous," Haynes said. "We care deeply about our consumers and were very concerned to hear of the selling of counterfeit products claiming to be M·A·C Cosmetics at a flea market in Texas. M·A·C Cosmetics takes great pride in producing the finest quality prestige makeup products. Consumers can be assured that by shopping at one of our authorized retail accounts, they are purchasing genuine M·A·C products. For a complete listing of authorized M·A·C retailers please visit www.maccosmetics.com and click on the M·A·C store locator or call us toll free at 1-800-387-6707, option 8. We are working closely with the Grand Prairie Texas Police Department and are grateful for their hard work and diligence regarding this matter." "Counterfeiting is a global problem that we at Farouk Systems, Inc. take very seriously. Excellent law enforcement agencies, such as the Grand Prairie Police Department, are at the forefront of the fight against the sale of counterfeit products. Farouk Systems welcomes and appreciates the support and collaboration with law enforcement in order to combat this continuing problem."